Identification: Largest antelope in Africa. Grey to red brown in colour. Both sexes are horned. They have a dewlap and a white chevron and a tussle of hair on the forehead (in big bulls). They also have, a black garter on the front legs with white stripes on the sides, which is more prominent in younger animals. Size: Shoulder height 1,5 - 1,7m. Weight 460 - 1000kg. Habits: Live in groups of up to 1000. Mainly browsers but do occasionally graze, they love wild fruit. Well adapted for dry hot climate. Not territorial. Bulls can be aggressive towards each other. Calves are born mainly from August to November. Distribution: Kenya, Tanzania, Zambia, Angola, Namibia, Malawi, Botswana, Zimbabwe, Mozambique and South Africa. 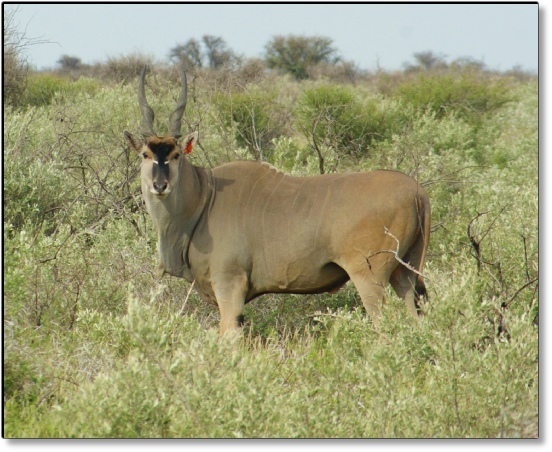 The Livingstone has a high commercial value compared to the Cape Eland and they have fetched record prices recently. The species offer an excellent return on you investment with a calving interval of 12 months. 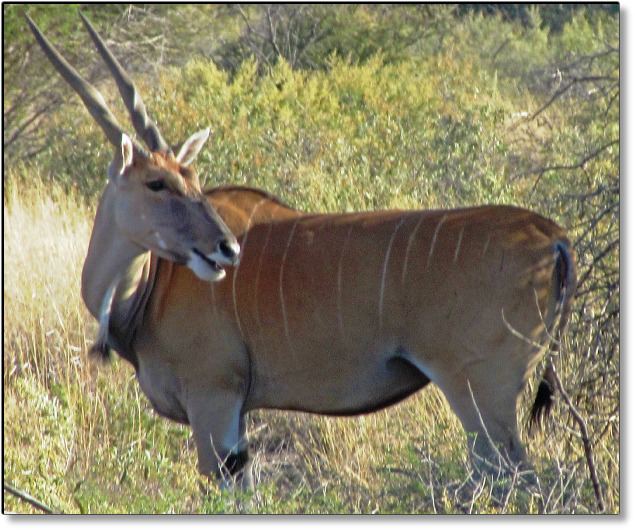 We offer some of the best Livingstone Eland genetics at Mattanu and the herd was imported during 1994 from the Southern Parts of Zimbabwe. We offer Livingstone breeding stock and trophy bulls.